History of the surname Buckle. This unusual name is of early medieval English origin, and is a metonymic occupational name for a maker and\or seller of buckles. The name derives from the Middle English word “bokel”, buckle, from the Old French “bocle”, from the Latin “buccula”, the cheek strap of a helmet, a diminutive of “bucca”, cheek. In some cases the modern surname may derive from a metonymic occupational name for a shield-bearer or maker of shields, from the Middle High German “buckel”, shield. The surname development has included Peter le Bucler (1203, Yorkshire) and William Bokeler (1317, Kent), while the modern surname can be found as Buckler, Buckel, Buckell and Buckles. The following are details of the Buckle Family. from the Grewelthorpe area. Information taken from census returns and Parish registers. Letter from Barry Page in Sept 2018. Re Percy Tomlinson Buckle. Percy was my mothers uncle . he was awarded a set of Maundy money presented by the Queen somewhere in the 1970’s. Barry has papers and photos. Kenzie Love is seeking information about Wm Frederick Buckle born in 1919 Montreal. CANADA. She thinks he is a descendant of William Frederick Buckle born Percy was my mothers uncle . 1864 mentioned below. Anyone who can help please contact this site. Letter from Michael Rust in South Africa. May 2012. Hi I stubbled onto your website looking for family members with the Buckle family name. I’m tracing my ancestry in South Africa and was wondering if you have any information of the Buckle(s) that emigrated to South Africa in the 1800’s. Letter from Peter Harridge -Sept 2012. My grandfather was Clarence William Buckle(my mum’s dad) and his Father was Thomas William Buckle. You have someone of that name on your site. Looking up the 1861 census, he is aged 8 months, but he is not on the 1871 or 1881 with his parents at least. There may be Thomas Buckle’s somewhere in the country but with no link to his parents so i don’t know if its the same person.. He is on 1901/1911 census in Rochester, kent but his birthplace is Yorkshire so that fits in. According to the 1861 census John Buckle was a labourer. Any idea what happened to John or Maria buckle by 1871, or for that matter Jane Jackson who was Maria’s daughter before she met John Buckle. If you can help Peter please contact by the link with Thomas William Buckles details below. ANN BUCKLE. Bap. 12.8.1798 Kirkby Malzeard. Dau of Henry [the butcher] & Jane Wood. ANNIE BUCKLE. Born 24 June 1894 Kirkby Malzeard. Dau of Matthew & Sarah Tomlinson. Confectionery maker with her sister Mary Alice. BERTHA CLARICE BUCKLE. Born 24.6.1896 Harrogate. Died March 1974 Claro district. Dau of Thompson & Jane Ann Barker. CHRISTOPHER BUCKLE. Born C 1829 Kirkby Malzeard. Son of Matthew & Mary. Married in 1851 to Esther Ingleby. DOROTHY MAY BUCKLE. Born C. 1910 Pickhill. Dau of John James & Celia, Living Dishforth 1911. ELLEN BUCKLE. Bap. 17.5.1807 Kirkby Malzeard. Dau of Henry [the butcher] & Jane Wood. Unmarried in 1871 living with her sister Elizabeth in Burley. ELIZABETH BUCKLE. Bap. 25.3.1691. Dau of Joseph. ELIZABETH BUCKLE. Bap. 21.7.1811. Dau of Henry [the butcher] & Jane Wood. ELIZABETH BUCKLE. Born C. 1820. Kirkby Malzeard. Wife of William Walker. Farmer born Ilkley. Living Mount Head Farm, Burley in 1871. ELIZABETH BUCKLE [nee ?]. Born C. 1830 Kirkby Malzeard. wife of Henry. EMMA BUCKLE. Born C1895 K.Malzeard. Dau of Mary. EMILY BUCKLE. Born C. 1867 Durham. Dau of Matthew the sailor from Kirkby Malzeard. Living Durham 1891. ERASMUS BUCKLE. Born C. 1862 Laverton. Died 28.1.1935 Ripon. Son of Matthew & Mary Lofthouse. of Castiles Farm. Married Emily Jane Wood. of Laverton. in 1884. FRANCIS J. BUCKLE. Born 17 June 1871. Married to Annie [born 1886]. A small holder in Snape Bedale in 1939. GEORGE ERASMUS BUCKLE. Born 29.11.1923. Bap. 30.12.1923. Died 1994. Son of Harry Oliver & Selina. Lived Oak Cottage. GEORGE RICHARD BUCKLE. Born 24.12.1942. Bap. 28.2.1943. Grewelthorpe. Son of Norman James & Doris. HELENA MARY BUCKLE. Born 27 July 1872. Died 26 October 1952 lived in Kirkby Malzeard. She was a widow. She died in Princess Road hospital, Ripon. 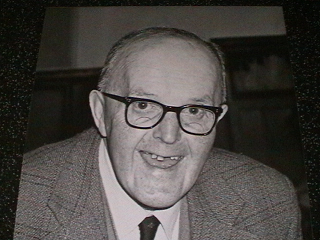 HARRY OLIVER BUCKLE. Born 12 May 1885. Laverton. Died 26 June 1952. Son of Erasmus & Emily Jane Wood. Haulage Contractor living Oak Cottage Grewelthorpe. Husband of Selina. Report in Ripon Gazette. July 1952. After a long illness, the death took place of Henry Oliver Buckle of Ashgrove, Ripon. 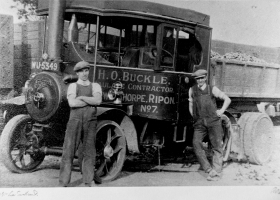 He was aged 67, born in Laverton, and lived in Ripon for 24 years. A member of Ripon cricket club. Survived by wife and sons. he was employed by Mr.W.Rigg. Henry Oliver Buckle’s vehicle. He worked out of the Quarry in Grewelthorpe. The men in the photo are Stan Ainsworth & Robert Ball. 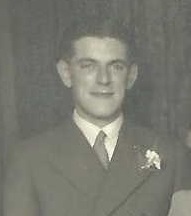 Henry Oliver Buckle at the wedding of his daughter Olive to Harry Rawson in 1947. HENRY BUCKLE. A butcher. Kirkby Malzeard. Married Jane Wood of Grewelthorpe. in 1795. HENRY BUCKLE. Bap 4.10.1801 Kirkby Malzeard. Son of Henry [the butcher] & Jane Wood. HENRY BUCKLE. Born C. 1830 Kirkby Malzeard. Son of Matthew & Mary. Married  Ann Lofthouse in 1856. Married  Elizabeth of Kirkby Malzeard in 1862. JANE BUCKLE. Bap 30.1.1805 Kirkby Malzeard. Dau of Henry [the butcher] & Jane Wood. JANE BUCKLE. Born C.1825 Kirkby Malzeard. Married Joseph Ingleby. of Eavestone. in 1852. Had a son Isaac. in 1856. JANE BUCKLE [nee ?]. Born C. 1833 Kirkby Malzeard. Dressmaker in Leeds in 1891. JOHN BUCKLE. Born C. 1825 Masham. Son of William. Husband of Maria Jackson. Bonnet maker of Grewelthorpe. Living Kirkby Malzeard 1861. JOHN BUCKLE. Born C. 1833 Biggin. Son of Matthew & Mary of Kirkby Malzeard. JOHN BUCKLE. Born C.1860 Kirkby Malzeard. Son of Henry & Ann Lofthouse. JOHN JAMES BUCKLE. Born C. 1883 Topcliffe. Son of Thomas & Mary. Living Grewelthorpe 1891. Married Celia of Kepwick, Northallerton in 1908 [b.1882] In 1911 living Dishforth. Had 2 children. JOSEPH BUCKLE. Buried 6.6.1693. Lived Grewelthorpe. Will proved 24.6.1693. Masham Peculiar. JOSEPH BUCKLE. Bap 27.8.1693. Son of Joseph. JOSEPH T.BUCKLE. Born 25 Nov.1853. Married to Selina [Born 1880]. He was a Tailor & Woollen draper. Had shop on Silver St. Masham. in 1939. 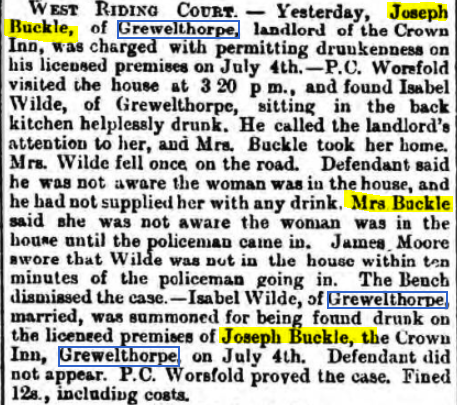 JOSEPH BUCKLE Landlord of The Crown Inn Grewelthorpe in 1893. Report in York Herald 1893. LENA BUCKLE. Born 1888 Laverton. Dau of Erasmus & Emiy Jane Wood. Married in 1912. LOUIE BUCKLE. Born C1897 Kirkby Malzeard. Dau of Matthew & Sarah Tomlinson. MARIA BUCKLE [nee JACKSON] Born C.1830 Grewelthorpe. Wife of John of Masham. Living Kirkby Malzeard 1861. MARGARET BUCKLE. Born C. 1872 Leeds. Dau of Jane of Kirkby Malzeard. Dressmaker in Leeds in 1891. MARY BUCKLE. Bap. 21.5.1797 Kirkby Malzeard. Dau of Henry [the butcher] & Jane Wood. MATTHEW BUCKLE. Born C 1796 Kirkby Malzeard. Died Feb 24 1873 age 77. [ref. Knaresboro Post 1873] Married Mary. Son of Henry [The Butcher] & Jane Wood. of Grewelthorpe. MATTHEW BUCKLE. Born C. 1828 Kirkby Malzeard. Sailor. Living in Durham with dau. Emily. 1891. Widower. Retired. MATTHEW BUCKLE. Born C. 1835 Kirkby Malzeard. Buried 29.7.1890 Dallowgill. Farmed at Castiles Farm, Dallowgill. Married Mary Lofthouse. of Laverton in 1859. MATTHEW BUCKLE. Born C. 1857 Greygarth Dallowgill. Died Feb 15 1937 aged 80. Son of Henry & Ann Lofthouse. Married to Sarah Tomlinson. of Kirkby Malzeard in 1891 at The Zion Chapel in Ripon. They had 3 children. He was a General dealer of provisions. Matthew was clerk to Kirkby Malzeard Parish Council. MARY BUCKLE. Buried 16.2.1693. Widow of Grewelthorpe. MARY BUCKLE. Bap 24.7.1791 Kirkby Malzeard. Died 4.2.1846 Kirkby Malzeard. Married Joseph Preston. of Litton. MARY BUCKLE [nee ?]. Born C. 1828 Laverton. Wife of Matthew of Castiles Farm. MARY BUCKLE [NEE?]. Born C1852 Kirkby Malzeard. A widow in 1911. Laundress. Living Ripon. Had a dau. Annie Rennison. born C1873 Grewelthorpe. MARY BUCKLE. Born C 1861 Topcliffe. Living Fingerfield Grewelthorpe 1891. Wife of Thomas. MARY ALICE BUCKLE. Born 25 May 1892. Kirkby Malzeard. Dau of Matthew & Sarah Tomlinson. Grocer & Confectioner. Unmarried in 1939. NORMAN JAMES BUCKLE. Born 30 Nov.1914. Died 1996. Diesel Haulage Contractor. Husband of Doris. OLIVE MAY BUCKLE Born 14 June 1918. Died 30 Dec. 2005. Dau of Henry Oliver Buckle & Selina Horler. 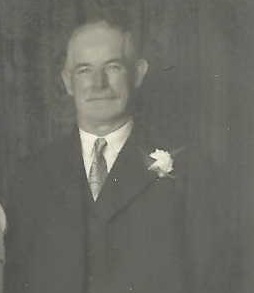 Married Harry Rawson. in 1947. PERCY TOMLINSON BUCKLE. Born 8.11.1901 Kirkby Malzeard. Died 25 May 1985 in Harrogate.. Son of Matthew & Sarah Tomlinson. Married 15.9.1934 to Emily Annie Josephine Burl. at Christ Church Harrogate. He was a chauffeur mechanic. Percy giving away his niece at church in Victoria Rd. Ripon. Thanks to Barry Page for photos. ROSE MARGERY SARAH BUCKLE. Born C. 1908 Carthorpe. Dau of John James & Celia. Living Dishforth 1911. THOMAS WILLIAM BUCKLE. Born 9.8.1860. Kirkby Malzeard. Son of John & Maria Jackson. of Grewelthorpe. Married in 1894 to Florence Ann Stedman. of Rochester. In 1901 Thomas was a builders carman. In 1911 he was a skilled labourer/driller on the dockyards. he had 2 children Unwin Gordon Buckle. [b1896] & Clarence William Buckle. [b1899]. Please contact Peter Harridge for more information about this family. Marriage certificate for Thomas & Florence. THOMAS BUCKLE. Farmer born C1831 in Topcliffe .Lived Fingerfield Grewelthorpe on 1891 census. Husband of Mary of Topcliffe. had son John James b.C1883. Topcliffe. THOMPSON BUCKLE. Born C. 1860 Laverton. Died March 1937 Knaresborough. Son of Matthew & Mary Lofthouse. of Castiles Farm. He was a Carpenter. Married Jane Ann Barker. in 1890. WILLIAM BUCKLE. Resident of Grewelthorpe. Listed for Claro Wapentake Tax on Lady Day 1672. WILLIAM FREDERICK BUCKLE. Bap. 13.1.1864 Grewelthorpe. Son of John & Maria. WILLIAM [WILLIE] BUCKLE. Born C.1894 Kirkby Malzeard. Stepson of William & Zilla Moore. Living Grewelthorpe 1901. ZILLAH BUCKLE. Born C. 1871 Kirkby Malzeard. Dau of Henry & Elizabeth. Had son Willie. married William Moore. [woodman] of Grewelthorpe. and in 1901 they had 5 children + Willie. If you can add any further information to this page please contact me.